One in 10 horses or ponies may develop at least one laminitis episode each year, making it just as common as colic, according to a new study led by Dr. Danica Pollard, a Ph.D. student at the Royal Veterinary College. The research was conducted by the Animal Health Trust in collaboration with Rossdales Equine Hospital, and funded by World Horse Welfare. Laminitis is a debilitating disease that affects the structure and healthy function of equine feet. It is an extremely painful condition in horses and ponies that has significant welfare implications. It often recurs in individual animals and around 15% of equine deaths in the UK are linked to laminitis. The study followed 1,070 horses and ponies in Great Britain and monitored regular updates on their management and health over 29 months. Despite a longstanding belief that laminitis is a spring-time disease, this study has identified that there is no 'safe' season, and laminitis remains a threat across England, Scotland and Wales regardless of the time of year. The research, published in Equine Veterinary Journal, has emphasised that laminitis needs to be considered an important year-round equine welfare concern in Great Britain. Owners must remain vigilant and not reduce preventive measures when they mistakenly believe that the 'high-risk' period is over. Furthermore, the study highlights the importance of recognising subtle signs of potentially life-threatening episodes. 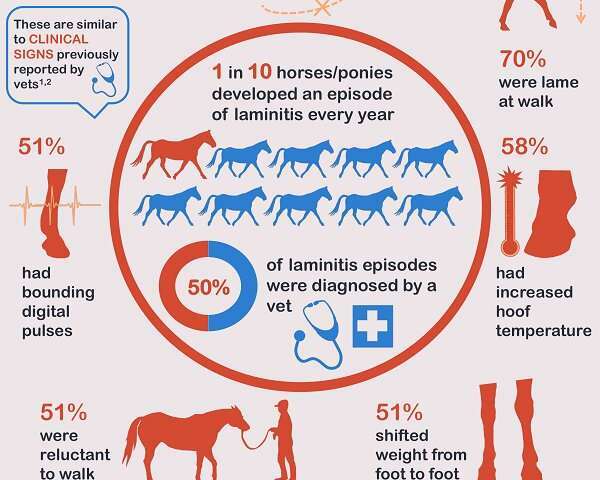 Most laminitic animals were reported by their owners to display non-specific and mild clinical signs, including difficulty in turning and a short/stilted gait (also referred to as 'pottery' gait) or lameness at walk—present in over 70% of laminitis episodes. However, less than a quarter of affected animals displayed the more classically recognised signs, such as the typical 'rocked back on the heels' laminitic stance and divergent hoof rings (rings that are wider at the heel than at the toe). Furthermore, a considerable proportion of horse/pony owners did not assess the presence of a bounding digital pulse, a commonly reported clinical sign of laminitis by vets. This suggests that owners may benefit from additional help with correctly locating and assessing their animal's digital pulse, which could contribute to earlier detection of laminitis episodes in the future. The research also found that only half of the 123 owner-reported laminitis episodes were confirmed by a veterinary diagnosis. Therefore, despite laminitis being considered a medical emergency by vets and expert researchers, many animals with laminitis are not receiving initial veterinary attention. Owners are encouraged to consult their vets if they suspect laminitis, or if they notice any of the subtle clinical signs associated with the disease, as by the time even subtle clinical signs arise, the damage within the foot has already begun. Early diagnosis and appropriate management is crucial in preventing long-term, often irreversible damage to structures within the laminitis-affected foot. This study came about as part of a 4-year Ph.D. study by Dr. Danica Pollard. Her Ph.D. consisted of a joint study between the RVC and the Animal Health Trust (AHT) with Prof Kristien Verheyen and Dr. Richard Newton as supervisors. The research was supported by a grant from World Horse Welfare. Additional supervision was provided by Dr. Claire Wylie, a former RVC Ph.D. student who was then working at Rossdales Equine Hospital and is now at the University of Sydney. Although Dr. Pollard was registered as a full-time student with the RVC, she was based off-site at the Animal Health Trust for the duration of the project. Dr. Danica Pollard said: "Our findings indicate that laminitis is more common than we initially thought and occurs at similar rates to other high welfare health concerns, such as colic. We also need to stress that laminitis is not just a spring-time disease and it's essential horse and pony owners remain proactive about its prevention at all times of the year. This includes being vigilant of the perhaps more subtle, but as evidence indicates, also more common clinical signs which are a better representation of the majority of laminitis episodes. The earlier an episode is recognised, the earlier action can be taken to give that animal the best chance of recovery. We also encourage owners to consult their vets if they suspect laminitis and to work together with their vets and farriers as part of a 'laminitis recovery' team." With ongoing support from the Margaret Giffen Charitable Trust and World Horse Welfare the next step is to identify which management and health factors were collectively associated with laminitis development within this population of animals. Further results are expected later in 2019.